Located in the historic Hill neighborhood of Saint Louis, Missouri, Carnivore STL is a flame-grilled steakhouse for the people of casual American dining from the esteemed Italian families of the Hill. Ranked as the best New Spot to Try in St. Louis: July 2018 (FEAST Magazine), Carnivore STL fills the nearly 4,000-square-foot space on The Hill with a dining area, bar lounge, and outdoor patio gracefully guarded by a bronze steer at the main entrance. The interior highlights an warm, contemporary feel, comfortable for everything from the serious business meeting to grandma's birthday alike. As you enter the dining room, a hand-painted mural of the Hill’s culinary highlights, by artist Wendy Weller, colorfully connects diners to the new addition to the neighborhood. Local friends Joe Smugala and Mike Lutker, and their better halves, Kerri Smugala and Casie Lutker, created the steakhouse from places that they loved to share with friends. The couples both have roots in the neighborhood as Casie’s great-uncle was famed former resident and sports icon Yogi Berra and the Smugalas own the Hill BBQ spot, J. Smugs GastroPit, which debuted on the Hill last year. Mike Lutker, who previously ran the kitchen at the nearby Gian-Tony’s Ristorante for seven years, serves as the head chef to guide the contemporary comfort cuisine. Revel in the food and hospitality of St. Louis when you visit our classic steak house. With friendly service and food created with love, this family will make you & your party feel like members of theirs before you leave. Do you have a special event coming up that you need a large table RSVP? Would you like us to cater your work party? Are you finally going to tell her you want to be with her the rest of your life? Whether its an reunion or a life changing event, Carnivore STL is here to solve your problems with great service and better food. An additional menu is added including some South of the Border tastes, such as, Homemade Tortilla Chips, Rioja Salsa, Grilled Steak Tacos, Grilled Chicken Tacos, and the legendary Loaded Taco Flatbread (shown). If your lucky, we might add a special taco on the night you stop in, like Smoked Pulled Pork Tacos or the Gulf Shrimp Tacos! Olé! A juicy 8oz. Filet Mignon encrusted in hand-cracked black peppercorns, topped with blue cheese cream sauce and a heap of fresh crumbles. Served with house salad and side (shown with sautéed snap peas dusted with parmesan). The true MEAT of the menu outlining all of steak cuts, sizes, and toppings. Don’t graze over our FIVE housemate compound butters, our THREE Sautés (mushroom, onion, shrimp). or our from scratch Pasta selection. Enjoy! So many choices of breakfast kindness you should probably order more than one entrée just to be safe. :) Don’t forget the Margarita of the week is still available during Brunch along with other choices like the Peach Bellini, the Blue French 75, and Blood Marys. We always have some choices for the little ones that have also shown a liking to items of the main menu like the Carnivore garlic-parmesan potatoes and the Chicken Pops, but sub the hot dipping sauce for house marinara. WE KEEP THE OPTIONS OPEN AND SELECTIONS FRESH TO GIVE YOU A NEW EXPERIENCE EVERY TIME YOU JOIN US! Every 3rd Thursday, join us in our new venue space above Carnivore STL, the D'Amici Room, for tastings of select wines by A. Bommarito Wines paired with catered snacks from your beloved Carnivore STL steakhouse below. Mark you calendar for a great night with friends and take home some of the wine lesson with you by getting your $10 entry fee OFF the first bottle of wine you buy!!! Call us at 314-449-meat for any questions on the event or monthly theme. Great drink specials, tasty bites, and even better company. Come try some bitesize versions of some favorite appetizers like cheese-filled Aracini Balls and savory Steak Medallions. You don’t have to be a wine connoisseur or vineyard expert to appreciate the taste of a glass of wine. At Carnivore, we have incorporated selections that accommodate all our guests into our new wine menu that was released this past week. With this new menu launch, we are also excited to feature a RESERVE LIST. We have some new bold choices our servers would love to share with you. WE LOVE TO SHARE OUR STORY. "Joe Smugala and business partner Michael Lutker wanted to give their neighborhood, the Hill, something new — a steakhouse. In a place dominated by classic Italian eateries, it might sound like a crazy idea. But Smugala has experience coloring outside the lines. A few years ago, he opened the neighborhood's only barbecue joint, J. Smugs GastroPit. He was ready to take a gamble again, and this weekend, Carnivore (5257 Shaw Ave., 314-449-6328) officially opens its doors. Smugala has been in the restaurant business since 1989, when he opened a pizza place, Smugala's Pizza Pub, now located in Arnold. "I've always liked to grill," Smugala says....."
ST. LOUIS — Carnivore comes from the same family who opened a barbeque joint on the Hill called J Smugs GastroPit. The steakhouse is located on the corner of Shaw and Edwards on The Hill, in the former Mona's space. The Beef Modiga Flatbread is a popular item on the menu. And of course you can a 14-ounce ribeye or 10-ounce filet with a side of shrimp. Yes, the lines are long. But at the end of each one is pizza. 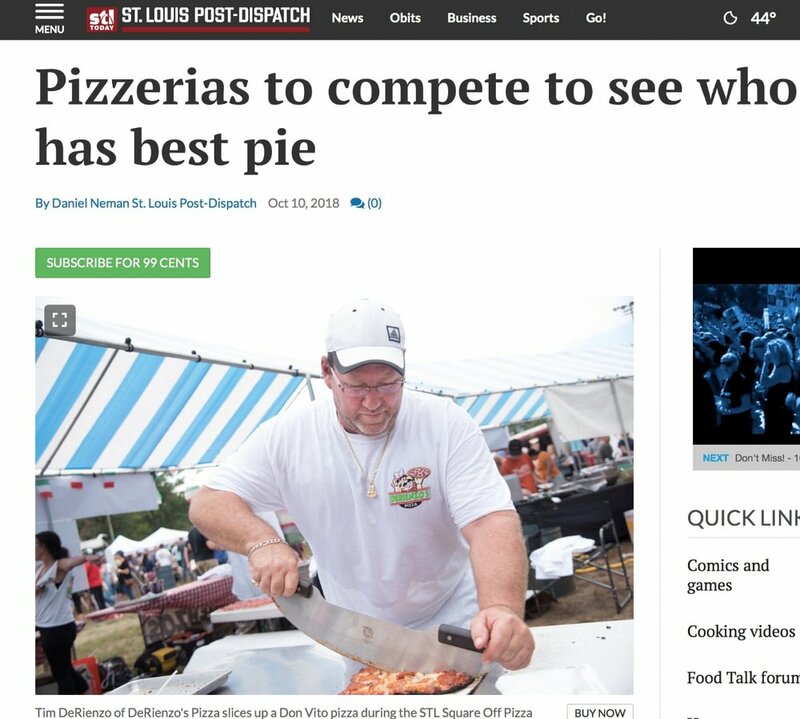 The STL Square-Off Pizza Festival on the Hill will be held Sunday in Berra Park. Eight local pizzerias will go head to head to head to head to head to head to head to head to determine whose slice is beyond compare. ST. LOUIS - When the dough hits your eye from a big pizza pie...Tim probably threw it! That's right...Tim's in the kitchen at Carnivore on The Hill preparing for the STL Square Off Festival, celebrating St. Louis style pizza. Could Tim be the next great pizza chef? Probably not, but there's more than pizza going on in this episode. The STL Square Off benefits Hill 2000 Neighborhood Association, which moves to the needs of The Hill community simply by doing what they do best: food, events, and community. Dewey's Pizza does more than just feed the community, they do much more through the DewMore initiative. At 103 years young, Virginia Leitner is giving back through her art. Rodney Smith Jr. is impacting the world with a lawnmower. Meet these amazing people doing amazing things by simply doing what they do, Saturday at 8:30am on Fox 2.